In the violent country of Ludania, the classes are strictly divided by the language they speak. The smallest transgression, like looking a member of a higher class in the eye while they are speaking their native tongue, results in immediate execution. Seventeen-year-old Charlaina has always been able to understand the languages of all classes, and she’s spent her life trying to hide her secret. The only place she can really be free is the drug-fueled underground clubs where people go to shake off the oppressive rules of the world they live in. It’s there that she meets a beautiful and mysterious boy named Max who speaks a language she’s never heard before... and her secret is almost exposed. I have been waiting for The Pledge for ages as I have read and really enjoyed Kim's Body Finder series. I was not disappointed and actually think I like this series even more. I enjoyed every page and cannot wait for the next instalment. Before I started reading this I thought I was fed up with dystopian books after reading a long line of books that were very similar to one another. What I liked about this one was how unique it was in its ideas. I loved the use of language as a way of dividing the population into different classes and found the way in which the world was run in the book absolutely fascinating. The historian in me loved all the scenes in the royal court and seeing how the Queen ruled her country with complete tyranny. I enjoyed the twist where she was desperate for a female heir rather than a male one. I also loved all the political stuff especially looking at how the society was dealing with living under such a tyrannical ruler. I loved the main characters Charlie and Max. I loved seeing their relationship developed over the story. I particularly loved Charlie as she was feisty and really loyal and I liked seeing her develop as a character. I won't tell you too much about the storyline as what happens but needless to say I really enjoyed how it went and found the whole book fascinating and a really engaging read. All in all a book I really loved. I cannot wait to see where the story goes next! I'm curious about the sequel too even if I didn't enjoy The Pledge as much as Kimberly's The Body Finder series. Thanks for your review! I found this book so addictive; I had to keep turning the pages to find out what would happen next and I'm definitely interested to read the next edition! 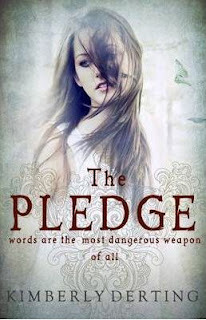 I really enjoyed the Pledge - like you I'm also looking forward to the sequel... curious to see where the story goes.